A large number of New Balance 997 reviews claimed the shoes are well-made. Numerous reviewers like the REVlite cushioning for its superior impact protection and comfort. Several observers noted that the updated materials in the New Balance 997’s re-issue are better and plusher than the original ones. The ENCAP midsole gives protection and stability as most users attest to the great feet protection in daily activities. A lot of buyers appreciate the excellent mixing and matching of the suede and mesh upper material of the New Balance 997 shoes. Some wearers claimed the rubber outsole could withstand pressure as it provides traction and a good grip to the ground. The throwback design gives some of its older wearers a nostalgic vibe in wearing a popular 1990s running shoe. Several customers love the Made in the USA version of the shoe for its quality and durability. A few reviewers find the price of $210 per pair reasonable for the Made in the USA version. Some reviewers find this shoe a little narrow. A few comments on the suede material easily chipping off after heavy usage. A small number of customers find them difficult to clean or wash. Plastic support details on the upper according to some users tend to peel off after a few months of use. One of the newer retro runners released by the Boston-based shoe manufacturer, the New Balance 997 lifestyle sneaker is a well-made shoe equipped with a reliable midsole that protects the feet and provides stability. Made in the USA, the quality is guaranteed. While the design has been kept the same, these are geared with a few updates on materials for best cushioning, breathability, and traction making this sneaker a formidable runner and a reliable retro sneaker. Be prepared, though, to shell out some cash since these kicks are deemed pricey. Homegrown US brand New Balance has always been the patriotic All-American brand from Boston, Massachusetts. The brand has remained an athletic shoe top seller because it is based on the idea that better fit and technology results in excellent performance. The message the brand has been sending its multitude of fans is relatively simple: the shoes speak for themselves and not the stars that endorse them. Investing in research, design and new technology, New Balance through the years have shunned substantial endorsement deals in favor of shifting more focus on the shoes than on the stars. The seemingly conservative principles of the brand trace back to its roots in 1906, when the company was founded by William J. Riley as the New Balance Arch Company in Belmont, Massachusetts. The company focused on manufacturing arch support and orthopedic shoes for several decades concentrating on this small niche market which rarely went out of state. New Balance’s strength lies in the quality of their shoe, durability and comfort and their ability to respond to market needs and demands. Soon, manufacturing facilities in Massachusetts and Maine were improved introducing computer-assisted design systems that lessen product development and production times by half. While competitors seem to be rolling out new designs only after a year, New Balance can do it in just four months. They continued to focus on domestic production that from the 2000s up to the present, more than 70 percent of their production remained in the United States. Their production for the European market also stayed in their manufacturing plant in Flimby, England in the United Kingdom. Among the shoe models that have been made in the manufacturing plants of New Balance up to this day is the NB 997. Originally released 1991 that resulted in huge sales, the running shoe was re-issued in 2015 with newer colorways and design collaborations with top retailers. The American brand has also maintained its pig suede upper and mesh material combination that gives a retro vibe to the 1990s hit design. The classic New Balance 997 has released Made in USA versions promising All-American craftsmanship as it also features an upper made with Horween leather sourced from Chicago, and crafted by American workers in American factories. The favorite sneaker pays homage and tribute by only using the finest high-end leathers, timeless details, and extraordinary comfort elements. The new silhouette of the New Balance 997 sneaker was a favorite of many shoe retailers and personalities to tweak with their special colorways and designs. Some of the first colorways that came out for the New Balance 997 running shoe are grey, navy, white, and red tones. American sneaker retailer Concepts came out with the New Balance 997 Rosé colorway for their Concepts x New Balance 997 collaboration. Dropped in their Boston and New York stores, the “Rosé” colorway was named after the famous celebratory drink and not that of the flower. The shoe has a rosy pink theme in the suede upper with an embossed crocodile textile in the tongue and heel. In 2015, Concepts continued their collaboration with the American brand with the New Balance 997 “Luxury Goods,” a tonal colorway released on February 2015. Luxury brand Hermes is the personal inspiration in the supple leather and suede upper dropped exclusively in the CNCPTS New York store. The year 2016 also became a full year with amazing collaborations with famous streetwear brands. New Balance collaborated again with Horween tannery to offer up the highest quality leather sneaker possible, with the 997 profile that features supple navy leather in the upper and brown contrast in the inner lining and TPU heel counter. American specialty fashion retailer J. Crew also collaborated with the American shoe brand in the J.Crew x New Balance 997 “Butterscotch Candy” for Spring 2016. It was followed by the New Balance 997 “Moonshot” with lunar-inspired colorway features in the off-white pigskin suede upper with midnight navy blue and white accents to mimic the look of the moon in the night sky. A New Balance 997 Air Exploration Pack, meanwhile, offered a combination of cloud-white leather with red and blue accents inspired by US astronaut suits. Concepts again renewed its collaborative partnership with New Balance for the New balance 997 Rivalry Pack. Iced Blue and Tonal Blue colorways were also released in 2016. Japanese lifestyle label Beauty & Youth also came out with a minimalist design comprised of off-white suede and mesh or a matte black color that even sneaks some snakeskin on the heel for the Beauty & Youth x New Balance 997 collaboration. The Horween leather designed NB 997 was also released in 2016 as well as a camo-toe colorway flaunting a tonal grey upper throughout with a camouflage canvas textile landing on the toe to work in perfect harmony with the leather and nubuck panels. The year 2017 was a good year for a follow-up between J. Crew and New Balance Classics. The New Balance 997 Cortado has a light tan suede upper with a dark grey midsection, with a premium vachetta tan-colored N-logo. Refined and straightforward light grey shades on the tongue and heel match a white midsole while a classic gum outsole adds a dull finish. Also in 2017, the classic and much-loved retro runner gets updated with a more minimal Deconstructed rebuild in the New Balance 997 Deconstructed. Another collaboration is the Stance Socks x New Balance 997 First of All Pack. It features a tan suede upper with hints of blue. Continuing the colorway releases other New Balance 997 collaborations include the Grey/Aqua and Navy/Maroon. Known for its clean design and silhouette, the New Balance 997 has focused more on functionality rather than style. The pig suede and mesh upper are kept secured by a rubber sole that balances white and black tones. The cuts on the suede material were carefully pieced together creating a great mix and match of colors on the material. New Balance has released amazing colorways for the 997 model. 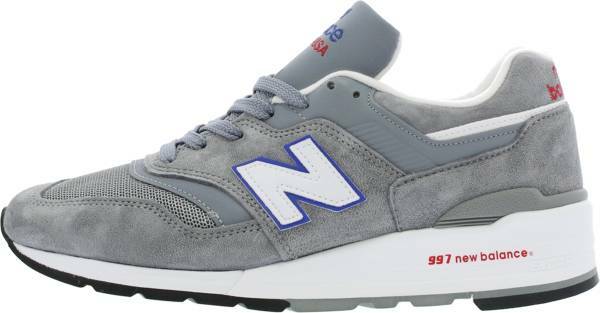 This includes the New Balance 997 in White, White-Blue-Red and the New Balance 997 Black Magnet, Cool Grey and other colors all projecting the Made in the USA branding. This fantastic play on various color palettes has also helped New Balance attract younger fans of their retro sneakers. The 997 model from New Balance runs true to size and is kept snug by a regular fitting shoelace. The retro running sneakers are available in sizes for men and women in standard medium widths D or B. Men’s sizes range from US size 5 to 13 while New Balance 997 women’s sizes range from US size 5 to 13. As a retro sneaker, the clean looks and finish of this runner from the nineties is its main feature as many sneaker fans have waited a long time for this re-issue. The colorways, however, feature more vibrant and bolder designs that are timely and trendy for the younger generation. Also, among its notable features are the retained ENCAP midsole that delivers stability and shock absorption while the REVlite superior cushioning and mesh overlays keep the feet light, comfortable, and well ventilated. New Balance had several collaborations with retailers and sneaker designers for their popular NB 997 model that includes the Concepts x New Balance 997, J. Crew x New Balance 997, Stance x New Balance 997, and Nonnative x New Balance 997. New Balance 997 designs were also released in homage to baseball with individual baseball packs in various colors. Among the celebrities spotted wearing New Balance 997 sneakers include DJ Clark Kent, Amanda Seyfried, and DJ Envy. Former US President Bill Clinton and Vice-President Al Gore used to sport the New Balance 997 in its OG tonal grey colorway on various occasions.